Our namesake room is the more feminine of the guest rooms and is tastefully decorated in blues and pinks. 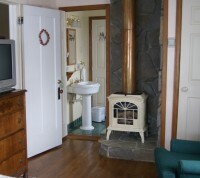 This front corner room, with a mountain view, contains a satellite TV, a comfy queen size bed and upholstered chair to relax with a good book in front of the decorative gas stove. Original artwork adorns the room. The private bath contains an oversized tiled shower. Air conditioned in summer. A rollaway bed can be placed in either the Irish Rose Room or the Emerald Room to accommodate a child or friend.